Cleveland is all too famous for a depressing kind of magic: the place can make businesses disappear. But there are stories of renewal here, too. In 1992, the bakery chain that defined Northeastern Ohio became the latest business to close its doors. As it turned out, that wasn’t the end of the story, but the beginning of mine. At its height, Hough (pronounced “Huff’s”) Bakery was a $25 million business with 1,000 employees and some 81,000 square feet in operating space spread over 30 locations across our region. Hough’s bakeries were beloved for their cakes, butter cookies, coconut chocolate bars, and “daffodil” cakes, all of them made from scratch and with top-quality ingredients, not mixes. The business began with Lionel Archibald “Archie” Pile, who was born on August 29, 1879 in Barbados and immigrated to New York City, where his brothers lived, at age 21. In 1902, Archie Pile moved to Cleveland, Ohio, where he also had relatives living. He worked at a local grocery store on Hough Avenue, earning $8 per week. After saving $57, Pile made a down payment on what would soon become the first location of Hough Bakery. On May 25, 1903, Pile opened his doors for business on Hough Avenue. Shortly after, he fell in love with and married Kate Welker. Together, they raised their six children during World War I. As their family grew, Hough Bakery also prospered, despite the ensuing Great Depression. The Piles’ four sons eventually joined the family business, and by the 1950s they led the operation with their father’s wisdom. Archie Pile and I share a first name, and a devotion to quality baking. I was born in 1948 in Wildwood, Tennessee and grew up under the care of my grandmother. There were very few black families in the small rural area. As a young child without many other children to play with, I would watch my grandmother as she baked and helped out whenever she allowed me to. Seeing her make breads, biscuits, and pies fascinated me, and planted a seed that would eventually grow. I visited relatives in Cleveland every summer and decided to move there in 1966, after I graduated high school. Once I arrived, I knew several people who worked at Hough Bakery, and they were able to help me get a job. 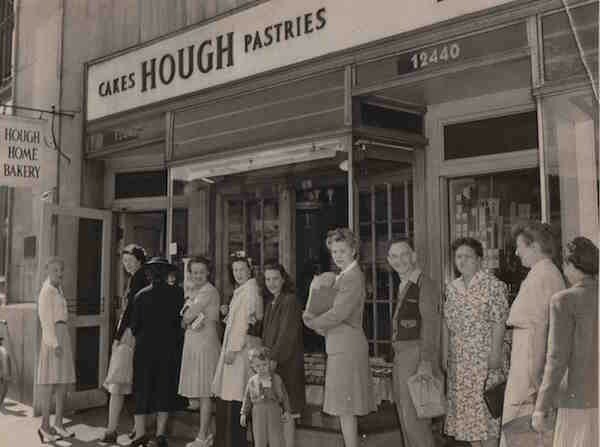 Customers form a line outside of a Hough Bakery in 1945. My first position was in the sanitation department. As a black person, it was difficult to rise in rank and join the bakery’s production team. I was denied advancement and told I needed more experience—the very experience they were denying me. After I filed a grievance with the union, the Pile family became aware of my situation and immediately promoted me up to production. This was where my passion for baking reignited, and from that point on, I was unstoppable. The bakers were very temperamental, and wouldn’t teach everything they knew right away. I had to gain the confidence of the two head bakers. So while one baker was off, I would tell the other one working how much more talented he was. Doing that with both bakers led to them teaching me secrets they wouldn’t ordinarily teach anyone. After working in various departments, I finally landed my dream job as one of the head bakers in the Specialty Bakery department, a.k.a. the Swedish department. It had gotten its name from an old Swedish baker who worked there and who wrote most of his recipes in Swedish. When he left, it was a nightmare trying to translate his work, which helped the name stick around. The department handled all large-scale catering orders as well as any special requests that customers might have. This was the department that handled the millionaires; we catered all of Bob Hope’s birthday parties back in the ’70s and ’80s. The largest dessert I created was a brownie cheesecake topped with fruit for an event at the Pro Football Hall of Fame in Canton, which served approximately 3,000 guests. Shortly after the Canton party, Hough Bakery closed. The chain had become so large that when the economy took a turn for the worse, it couldn’t maintain. The original owners sold the brand to a Wisconsin company that promised to retain all our employees, but was ultimately unable to do so. They began to consolidate locations, and eventually the whole operation went bankrupt. It came as a shock that August day, as we discovered our loss of employment on the six o’clock news. The labor union called a meeting for the remaining 400 employees. They wanted to assist us, but the local baking industry could not absorb that many jobs. I had the idea to reopen Hough Bakery as an employee-owned company, which led to many meetings and the formation of committees. But, unfortunately, we couldn’t raise the capital needed to move forward. The assets of Hough Bakery were then sold in bankruptcy court. Kraft Foods bought the bakery division just so they could lock up the recipes. People had tried to mass-produce imitations of our most renowned desserts, such as our seasonal daffodil cake, but even at twice the price our original recipes kept customers loyal. Getting ahold of those recipes let Kraft remove some of their biggest competition from the market. Our lack of success left me disappointed, but not distraught. I had always wanted to own my own bakery, so I went around to auctions buying used baking equipment, which I stored in my basement. To pay the bills, I worked part-time in various catering departments as well as doing odd jobs like planting flowers and washing walls. A few people I worked for took a liking to me, and one catering company even went so far as to give me a three-compartment sink for washing dishes, free of charge. I had always wanted to own my own bakery, so I went around to auctions buying used baking equipment, which I stored in my basement. Things seemed darkest as I looked in vain for a place to open up shop. Finally, I stumbled upon an old, unused bakery that still had a working oven, located in the neighborhood of Collinwood on the east side of Cleveland. The area wasn’t that well off, but at the time was a haven for people of Irish, Italian, and Hungarian descent as well as many black families. As soon as I signed the lease, I became paralyzed with fear. Would anyone show up? The day that I opened Archie’s Lakeshore Bakery in 1994, I knew things were going to be OK. Almost instantly, people flooded the place, many of them from the surrounding neighborhoods. They had feared they were never going to eat their favorite treats again and were grateful to me for keeping the tradition going. We still make everything from scratch and refuse to alter the quality of our ingredients. Because Hough Bakery had been a much larger operation than mine, my recipes were cut down in size, making them just different enough from the ones that Kraft had purchased to allow me to legally use them. A few years later, Kraft lost the national rights to the Hough brand, at which point I stepped in and acquired the name for myself. To date, our most popular dessert is undoubtedly our white cake, which blends the taste of almond with other flavors in a way that is only possible to achieve when you make it from scratch. We’re also known for our “Hungarian Delight,” made by sandwiching raspberry and fudge filling between two butter cookies. We can only make them in the colder months of the year, as the fudge will melt in the summer. The bakery has been open at the same location for 22 years now. People come from all over to visit us, but the majority of our customer base is still from greater Cleveland. Customers often come to share memories about growing up eating Hough baked goods. (The town of Davidson, North Carolina, which is home to many ex-Clevelanders, has asked us to open an outpost there). One time, a woman walked into our store and demanded that we allow her to cut into one of our white cakes, as she didn’t believe they were really Hough’s. I was working in the back when I heard a noise coming from the counter. When I investigated, I found the woman in tears. I asked her what was wrong, and she explained that this cake was a part of her childhood, and that she never thought she’d get to taste it again. But she had. At Archie’s Lakeshore Bakery, we’ve created a bit of magic of our own. 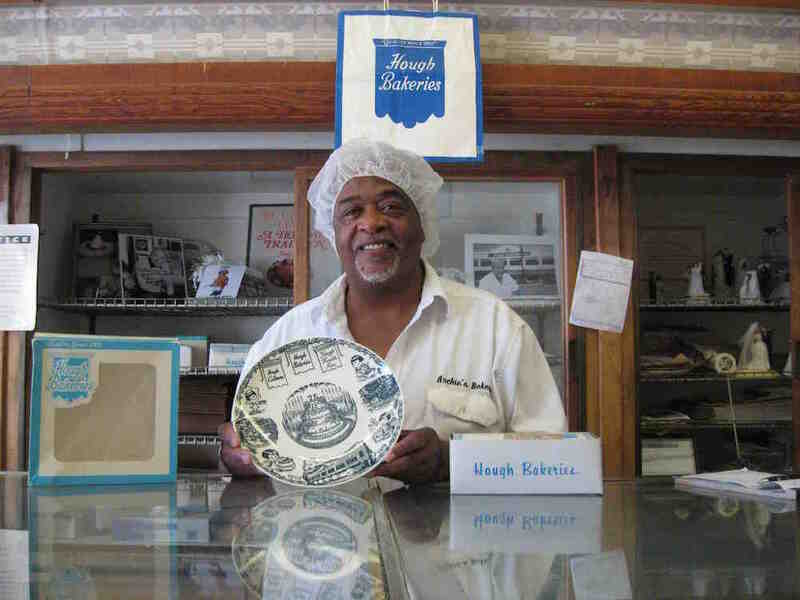 Archie Garner works alongside his wife Valinda and their two daughters, Sandy and Samantha, to own and operate Archie’s Lakeshore Bakery in Cleveland, Ohio. This essay is part of Cleveland: Why the Host of the Republican Convention Sees Its Future in the Rear View Mirror, a special inquiry from Zócalo Public Square. Primary Editor: Louis Patterson. Secondary Editor: Callie Enlow. *Photos courtesy of Cleveland Press Collection.